Sold. 12/2018. 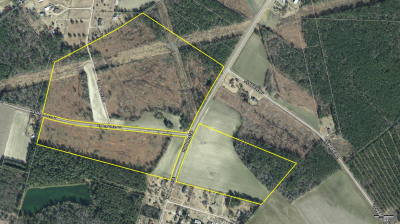 95 Acres of land, including 23+/- acres cleared cropland; recent cutover with 2300+/- ft of combined frontage on the E & W sides of Hwy 41A, 3600+/- ft of combined frontage on the N & S sides of Harper Rd, and 2000+- ft of combined frontage on the E & W sides of county dirt Creech Rd. Big acreage, little price! Just N of Marion, minutes from Wal-Mart and other commercial properties.